I promised you guys a full-sized beach bag a couple of months ago when I published this little mini beach bag gift card holder. 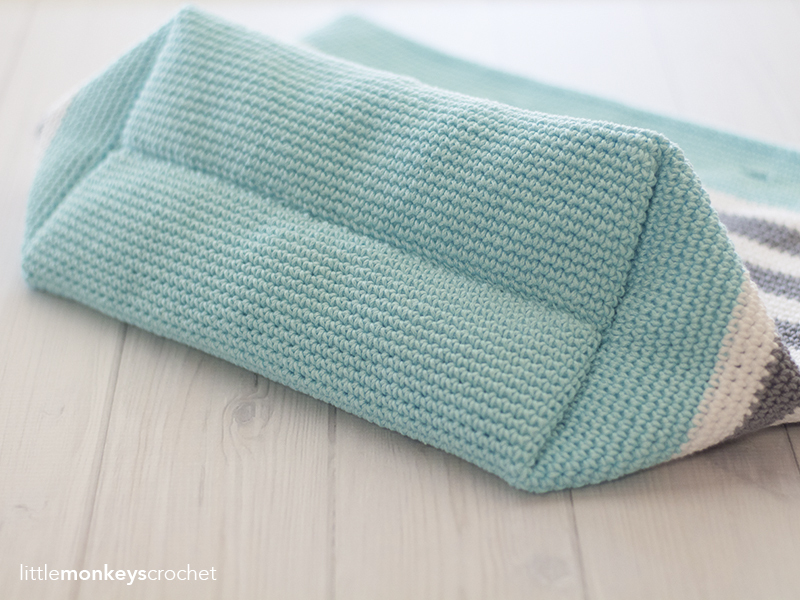 Baby Henry has kept this mama’s hands full, so crocheting time has been really limited these days… but it’s finally here! And let me tell you what, this bag has given me grief. I’ve worked and reworked it to find the best possible construction to deliver you a pattern that is super easy and very durable. But, I think I’ve succeeded! A confident beginner could make this bag, easily, and yet it still looks like something you could buy at the surf shop. 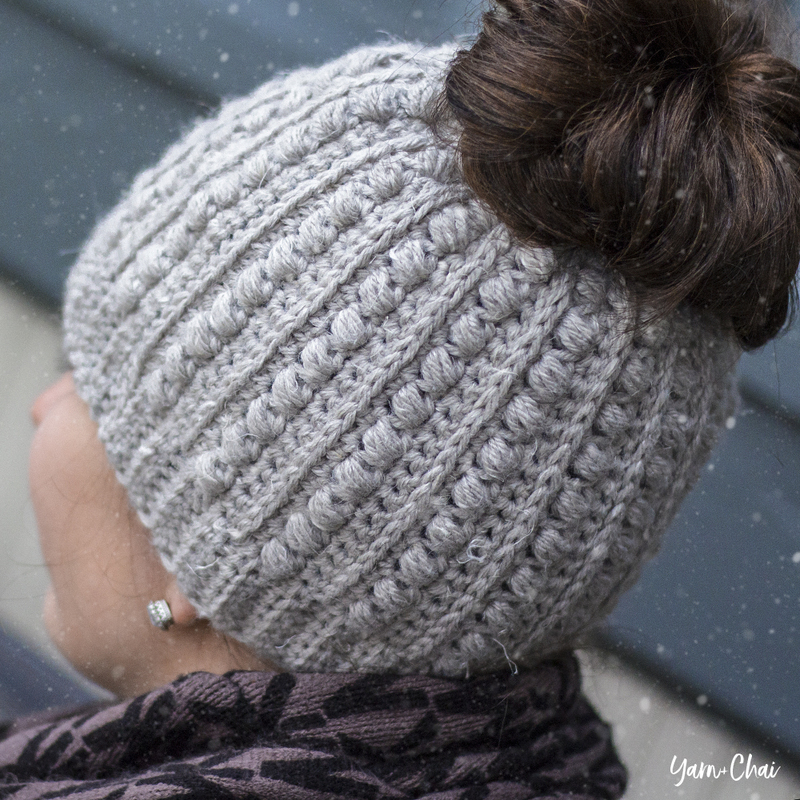 It has a very classic nautical-style pattern, but with really fun color options thanks to the yarn (Lion Brand’s 24/7 Cotton). I am absolutely in love with it! Oh, and did I mention… I made two sizes! One is perfect for you, and the other is perfect for your mini-me. 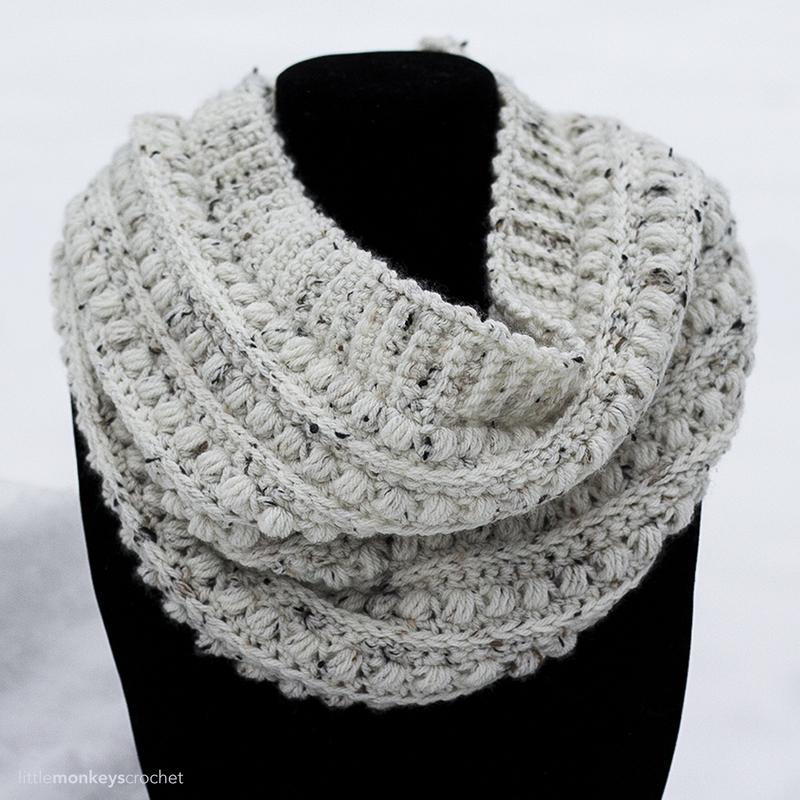 24/7 Cotton by Lion Brand Yarn is a worsted-weight, mercerized 100% natural fiber yarn. It has ah-ma-zing color, sheen and stitch definition, and a range of 24 fun shades. There are so many beautiful color combos you could utilize with this beach bag… you might just have to make more than one! Yarn: Lion Brand 24/7 Cotton in 3 different colors. 24/7 Cotton is a worsted-weight, mercerized yarn. Individual sizes and amounts are listed below. COLOR A (360 yards, or 2 skeins). Sample shown in "Rose." COLOR B (340 yards, or 2 skeins). Sample shown in "White." COLOR C (300 yards, or 2 skeins). Sample shown in "Navy." COLOR A (310 yards, or 2 skeins). Sample shown in "Aqua." COLOR B (220 yards, or 2 skeins). Sample shown in "White." COLOR C (180 yards, or 1 skein). Sample shown in "Silver." (3) Both Adult and Child sizes are written out in full below. After that section, you'll find instructions for shaping the bag and attaching the handles. These instructions are the same for both sizes. From this point until instructed otherwise, you will drop yarn at color changes and pick it back up again when needed. Do not fasten it off. Fasten off; weave in all ends. 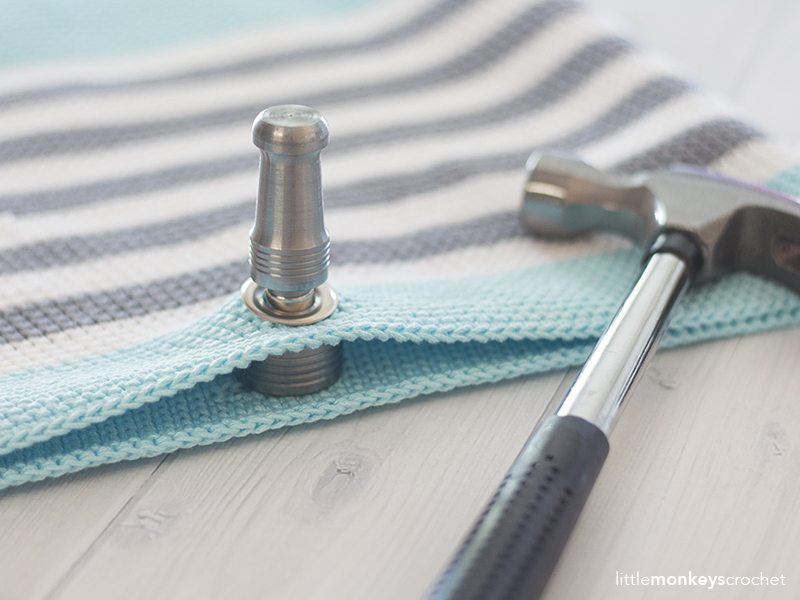 Important tip #2: When I was reading the reviews for the grommet set before I purchased it, I learned that it's best to do your hammering on a very hard surface (like your cement garage floor). This worked great for me. Keeping the bag inside out, lay it flat, lining up the grommets. Use COLOR A (a length about 4x the width of the bag) to sew the bottom of the bag closed, stitch by stitch. Fasten off and weave in ends. With the bag still inside out, turn it upside down and position the bottom so that one end lays out in a triangular shape, with the seam centered. Use a ruler and a piece of tape to measure and mark a 5" line across the corner of the base. 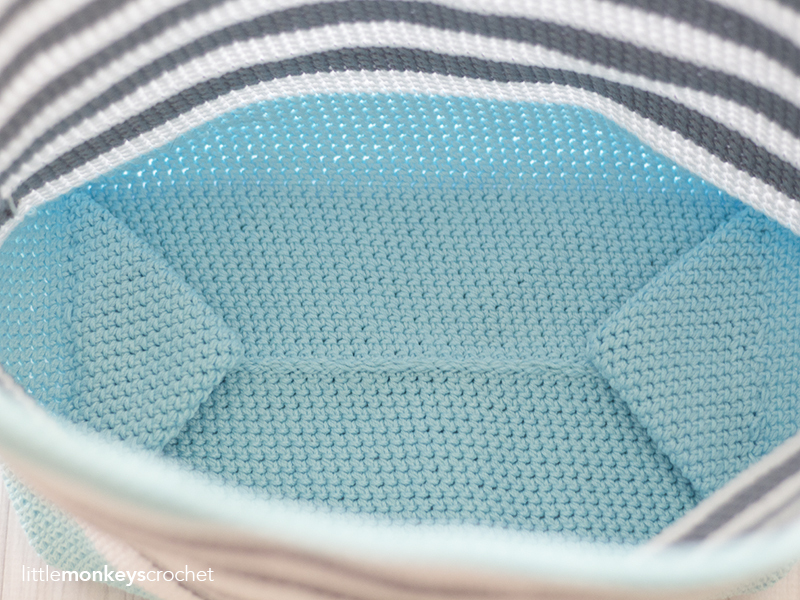 Sew a seam across the line (through both layers) with COLOR A. Repeat on the opposite side. This will make the inside of the bag roomy. Take your first rope handle and insert it through one of the grommets, going from the inside of the bag to the outside. 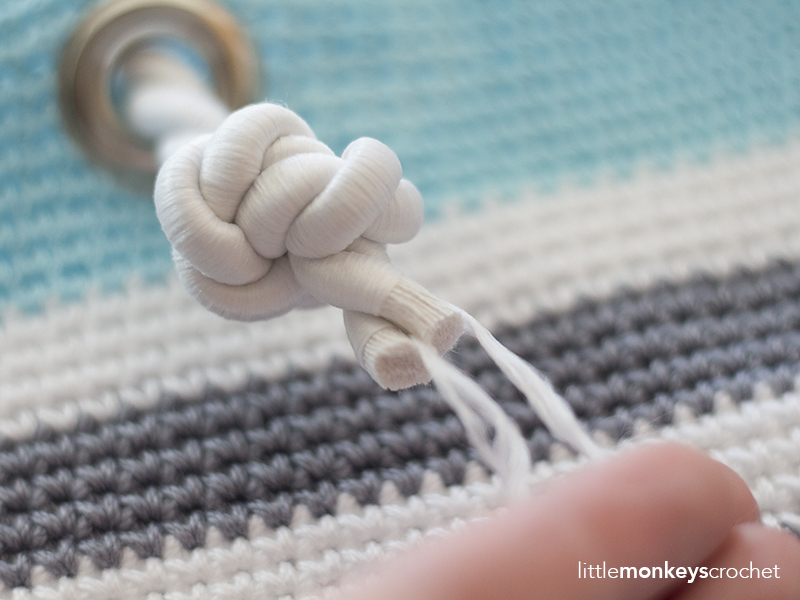 Tie a knot near the bottom of the rope on the outside of the bag and pull it tight (you can use your grommet to help by gently but firmly pulling the rope from the inside of the bag, which will pull the knot against the grommet and tighten it up). Then, use good scissors to cut the excess rope about 1/2" below the knot. If your rope looks like mine, it will have a couple strands of thread wrapped tightly around each twist. These are pretty easy to locate by gently pulling on the tips of the yarn. When you find them, pull them away from the yarn right up to the knot. Then use scissors to cut them off at that point. Give the exposed thread a little ruffle with your fingers; this will give your handles that classic weathered tassel look. 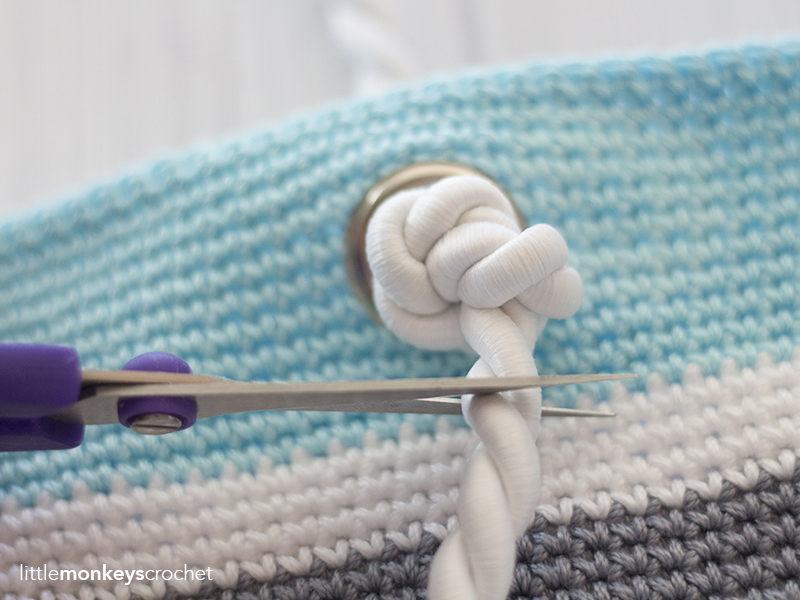 Repeat these instructions with the other end of the same rope (attaching it through the other grommet on the same side of the bag) to complete your first handle. Then, do everything again for the 2nd handle on the other side. Note that you'll want both handles to be the same length, so be sure to compare them when you're about to tie your final knot to ensure that the handle sizes match. That's it - you're done! Grab your favorite sunglasses and a beach towel and head to your favorite sandy spot in style. And don't be surprised if someone asks you where you got your gorgeous beach bag! Lovely Bag! Nice and I love it! Thank you for sharing! Wow, this is impressive! I really like the groomers and the tapered down edges. You are very talented. Thank you for freely sharing!!!! These are adorable. Thank you for the awesome instructions ? Thank you so much for sharing your patterns. I am new to crocheting and I don’t know why I took so long. Loving every minute of it. I was wondering, do you ever do videos. I can read a pattern but sometimes its just nice to see how a person does the stitches as Well. Easier to watch a couple of times to get the gist of it. Thank you so very much! This is the nicest one yet. I can’t wait to try it. Awesome pattern! Thank you for sharing! I’m currently working on 2 at the same time, but I have a question.. when you see the bottom, where do you place the joining seem? Do you have any tips on how to make a clean color change? I have been experimenting and every time I change colors it looks messy. Also, will the sl st ch 1 combo leave a visible “seam” in the bag? Hi Isabel! There is going to be a seam no matter what you do. Even if you did a seamless round, you’d have jagged edges each time you changed colors for the stripes. The good thing is that with this bag, the seam ends up over on the end of the bag where it’s the least noticeable. I’ve experimented a lot and I do a couple of things to produce what I feel is the least-obvious seam. As a general rule, I typically chain one less than is standard for whatever stitch I’m doing. So for SC with this bag, I actually don’t CH1 at the beginning of rounds; I just go straight into the first SC after joining the previous round. (I don’t put this in the instructions because it isn’t standard and it just causes confusion.) The other method I use in conjunction with that is the “jogless method” of joining, which I first read about here: http://needlenoodles.com/home/node/139 (Method #2 on her blog post). Hope that helps! Thanks for the feedback! Can’t wait to make the bag! Your beach bag is the most beautiful bag of all those bags I have seen. I haven’t try it yet, but I will some day. You have a very good taste. Thank you for sharing. Congratulations on your newest family addition. Very, very nice looking bag. 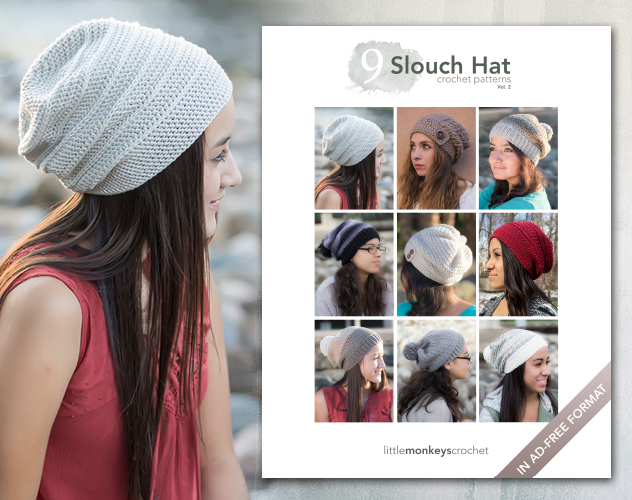 I hope to make one for my adult grand-daughter soon and I do appreciate you sharing the pattern. 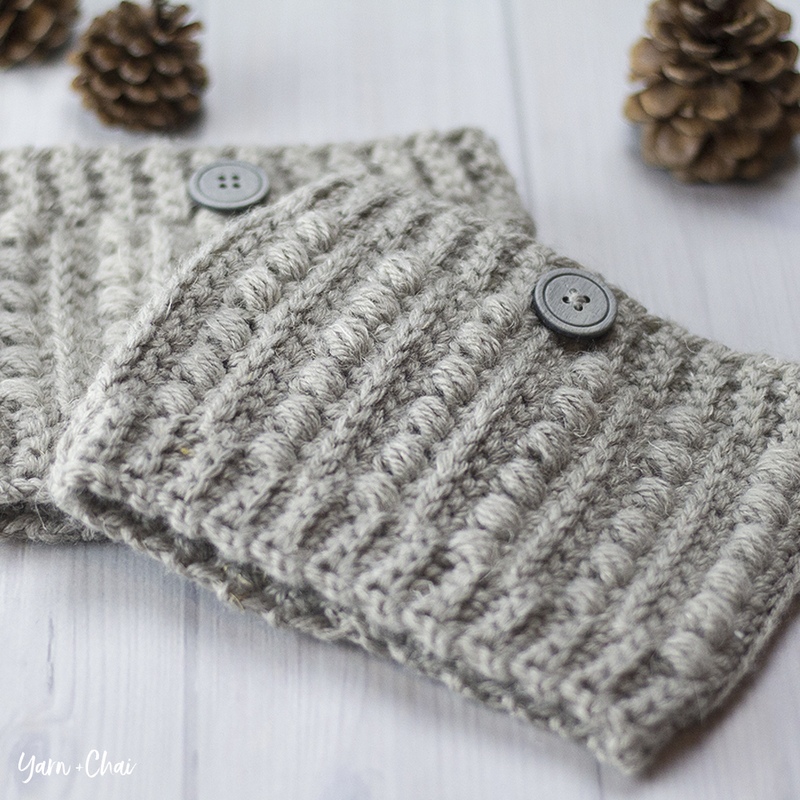 Beautiful and easy pattern!!!! I will make this pretty bag shortly. Hello! I love this pattern. Unfortunately I cannot get the Lion Brand 24/7 yarn quick enough to take on my business trip. 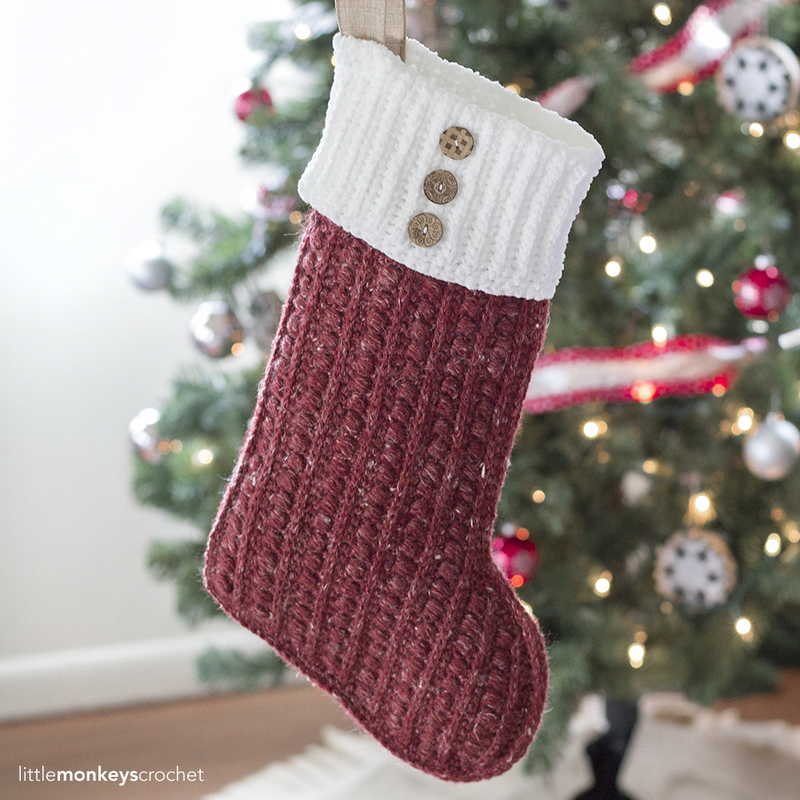 What yarn would you recommend substituting with? Honestly, I have not encountered a yarn that I would compare to the look and feel of 24/7. Yarnsub.com mentions I Love This Cotton or Peaches & Cream as a possible substitute, but neither are mercerized and will not produce the same shine, stitch definition or durability. I’ve used both of those yarns and I’m not sure that I would put the time into this bag using either of them because it’s not going to produce the same result. First off—love the pattern! Thank you for sharing it! When you say to ch 1 at the start of the round. Then you say “ch 1 at the beginning of the round DOES NOT COUNT as a stitch”. Then say to sl st to the top of the first SC (thereby ignoring the ch 1), this is where I get lost as some people do it differently. Am I chaining 1 then start my first SC in the same st as the ch 1? Or do I ch 1 and SC in the next st? If I ch 1, sc in the next st then I end up with only 191 as a count instead of 192. But since the pattern doesn’t specify to ch1, sc in the SAME st as beg ch to get started, I wasn’t sure what I should be doing. Yes, you start it in the same stitch as the chain 1. That’s pretty standard for single crochet stitches. Hi I’m just wondering if the bag is supposed to be slightly floppy or is it supposed to be stiff? I just started the bag but I am unsure whether or not the bag is supposed to be stiff or floppy. If that makes sense. 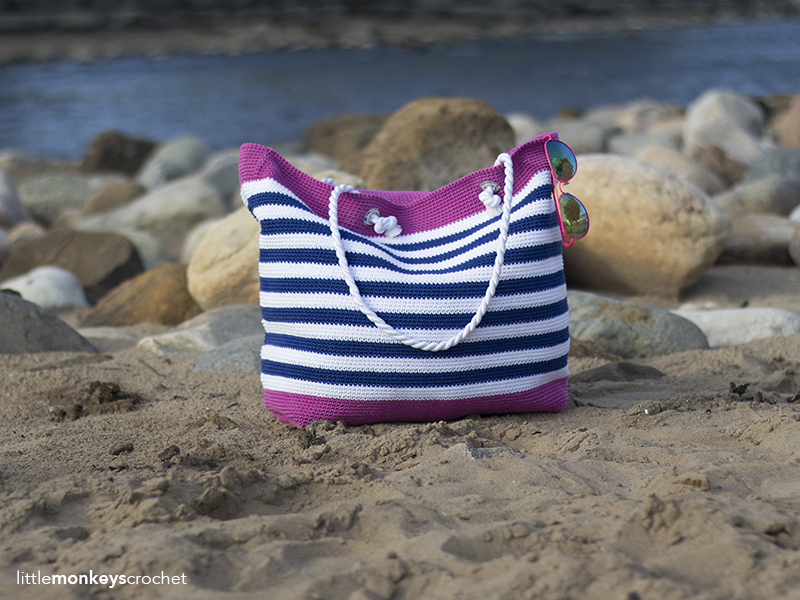 I’m making the classic beach bag and just had a quick question – do the stitches look like they are on a slight slant? Is the top of this bag suppose to be floppy or stiff with the rope handles? The top of my bag keeps flopping over to the sides when I put it over my shoulder! Do you think fabric stiffener would help fix this problem, if so, which one do you recommend. Thanks! It’s not stiff, but shouldn’t be so floppy that it flops over the sides when you wear it. That would be an issue with gauge or fiber, if you used a different yarn. I haven’t tried fabric stiffener; I thought about doing it when I was first designing the bag, but I was happy with the level of stiffness at the end so I didn’t worry about it. I made the adult sized beach bag for my retiring director at my work, filled it with a bottle of her favorite wine and a monogrammed white beach towel and she loved it. I used the same colors as you, although I did have to buy one more white and one more pink shade of the yarn..I ran out for some reason, but really loved it when it was finished. I ended up getting the braided cording at Menards, a nylon rope that actually was soft enough that it worked well. It was so expensive everywhere online and Joann’s didn’t have that size either. But I was very very happy with it. I kind of hated giving it away! thank you for the free pattern! I just wanted to say that I wasn’t being successful with the round to start another color either, so actually gave up trying and just went for it and tried not to worry about the jagged line. I didn’t carry the other yarn color, but just tied it off and attached the new color because I was worried about using too much yarn. in the end I actually didn’t think the join side was all that awful! another thing I did was have my husband cut a thin piece of plexiglass to fit perfectly in the bottom of the bag for stability and to keep it boxy looking and it looked great..I just cut a cardboard template of the bottom and he cut one for me. lovely bag. thanks for the pattern. i cant wait to try it. 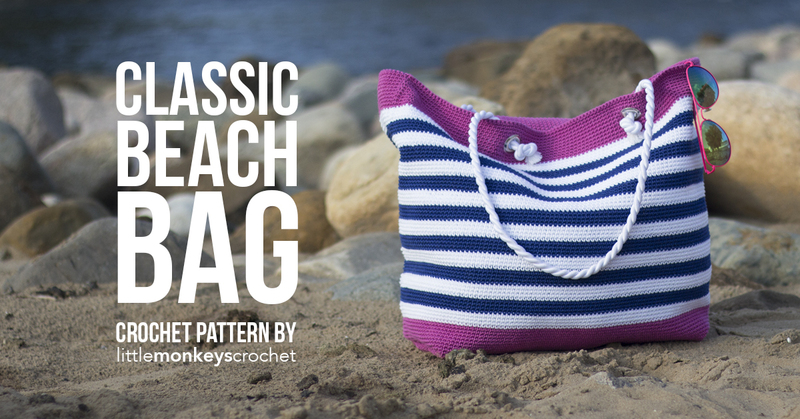 Hi Rebecca…..I love your beach bag patterns and have made several for friends and family. 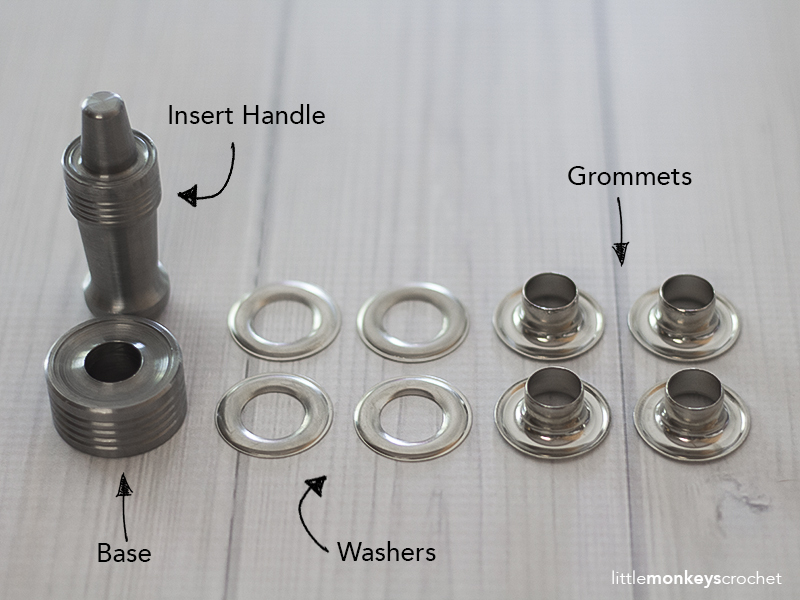 I stumbled on a great find from the Home Sewing Depot….they are white snap together grommets 1/2 inch in size…and they are super easy to attach to the bag. Please pass this info on to your website and maybe other people will find this easy too. Thank you for such wonderful free patterns. I do a lot of crochet in our local school colors, but I cannot find mercerized yarn in maroon or burgundy. Do you have any suggestions? Thank you. What do you mean by drop color. Do not fasten off? Thank you. I’ve been looking for a tote pattern that is easy to understand. Lindo bolso hhay algún patron q se pueda ver. Just finished this today! Love this bag!! Thank you!!! In was curious about the joining seam? I think that I’m following the pattern properly, joining with a slip stitch to the first stitch, not the chain 1 stitch. It thag correct? Does the “seam” kind of go diagonal up the bag as you go? Yes, it is diagonal. It will be on the side. 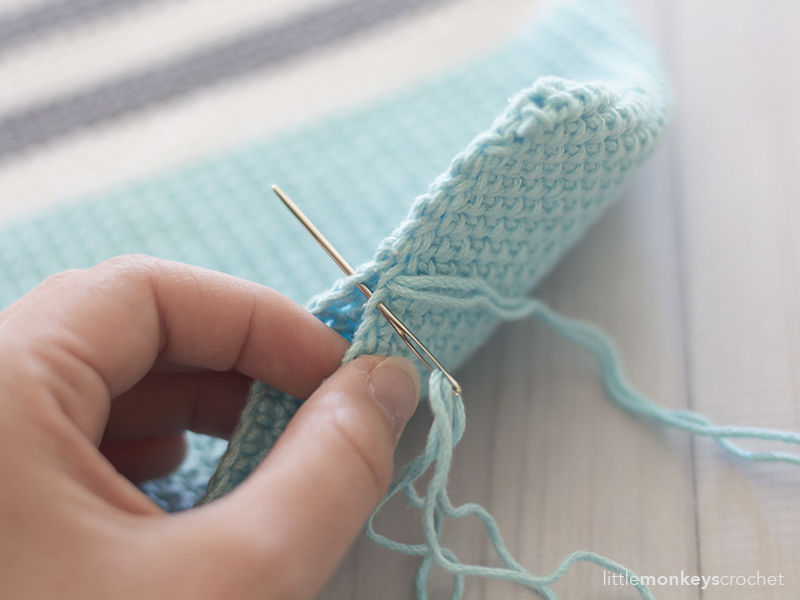 Just pull your yarn tight with those slip stitches and it won’t hardly be noticeable. Hi Mary! The seam is slanted; that’s naturally what happens when you work in unturned joined rounds. The seam will be on the side of the bag and very discreet. Thanks so much for replying. This is definitely a beautiful bag. Thanks for sharing! actually do u just mean to run the looses yard along the row and stick over it? anyways hope you can help/// thanks for making this pattern and for sharing !!! I live this pattern, except i can not get this to not spin. I had it at first then as i was working in rows 2-6 it spun and I dint want tovtear it all out. Can you help? I’m currently doing the classic beach bag. I watched your malia bag tutorial. In the beach bag is the progression in rd 2-24 similar to that as malia with seamless change to each row? Thanks in advance. I am on my second bag, crochet fairly tight, and chain 192 makes my bag about 28 inches long. They are very big and not the measurements you give. Am I doing something wrong? It simply sounds like a gauge issue. Did you do a gauge check? 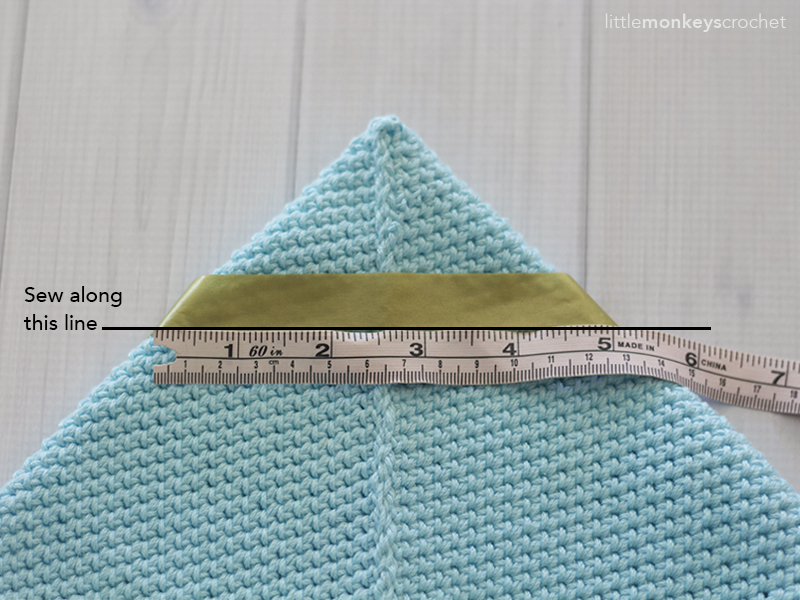 I’m a very tight crocheter and others often have to downsize their hooks. Is the seam of the bag supposed to go straight up the side? Mine is diagonal even though I constantly checked to makes sure my count was 192. Thank you in advance for your help.